As an ENERGY STAR® Partner, Energy Kinetics has determined that model EK1 meets the ENERGY STAR® guidelines for energy efficiency for oil heat input from 0.68 to 1.0 gph, propane input of 80,000 to 150,000 BTU/HR, and natural gas input of 80,000 to 100,000 BTU/HR. EK1 Energy Converter Total Weight: 270 lbs. EK1 Total System Weight 450 lbs. 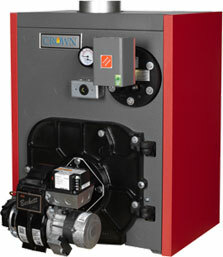 The Tobago (TWZ) Series boiler is an installer-ready, residential, cast-iron, oil-fired, water boiler. The Tobago is designed for installation with a standard chimney and is available in heating capacities from 80,000 to 241,000 BTU/hr. This boiler is available in a semi-packaged ‘Shorty’ version. The ‘Shorty’ is shipped with the burner and controls separate from the boiler. Options on the TWZ series include a domestic coil and your choice of three different oil burners: Beckett (standard), Riello or Carlin. Features of the TWZ series include a wet-base heat exchanger design, cast-iron burner swing door, a 3-prong quick disconnect for easy service, Honeywell operating controls, Taco circulator, and a barometric damper. Some TWZ models are ENERGY STAR® qualified. See the Product Ratings tab for more details.